Pointed question by senior legal expert: Would Modi want armed forces special powers Act dropped? Will Gujarat chief minister Narendra Modi seek to drop the current provisions of the Armed Forces Special Powers Act – under which Central forces are stationed in several states like Manipur, Assam, Jammu & Kashmir etc. for maintaining public order – in case he comes to power in Delhi? 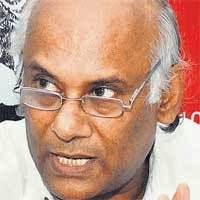 Senior Gujarat High Court advocate Mukul Sinha has obliquely suggested that this should happen logically if one agrees with the legal objections Modi has raised to the prevention of the communal violence Bill, which is proposed to be placed in the upcoming winter session of Parliament. Even as saying that it is “ridiculous to expect a district magistrate to go against the state government and discharge his duties”, Sinha has accused Modi of fueling a “hypocritical debate”, Sinha says the CM has attacked the “toothless provision” to suggest that it would destroy the federal structure of the constitution. Sinha says, “Modi is shouting on top his voice that our Constitution does not permit the Centre to send forces to any state or make any law in this regard, thus questioning the legal basis of the communal violence bill”.